A new explanation for a type of order, or symmetry, in an exotic material made with uranium may lead to enhanced computer displays and data storage systems, and more powerful superconducting magnets for medical imaging and levitating high-speed trains, according to a Rutgers-led team of research physicists. The team's findings are a major step toward explaining a puzzle that physicists worldwide have been struggling with for 30 years, when scientists first noticed a change in the material's electrical and magnetic properties but were unable to describe it fully. This subtle change occurs when the material is cooled to 17.5 degrees above absolute zero or lower (a bone-chilling minus 428 degrees Fahrenheit). "This 'hidden order' has been the subject of nearly a thousand scientific papers since it was first reported in 1985 at Leiden University in the Netherlands," said Girsh Blumberg, professor in the Department of Physics and Astronomy in the School of Arts and Sciences. Collaborators from Rutgers University, the Los Alamos National Laboratory in New Mexico, and Leiden University, published their findings this week in the web-based journal Science Express, which features selected research papers in advance of their appearance in the journal Science. Blumberg and two Rutgers colleagues, graduate student Hsiang-Hsi Kung and professor Kristjan Haule, led the collaboration. Changes in order are what make liquid crystals, magnetic materials and superconductors work and perform useful functions. While the Rutgers-led discovery won't transform high-tech products overnight, this kind of knowledge is vital to ongoing advances in electronic technology. 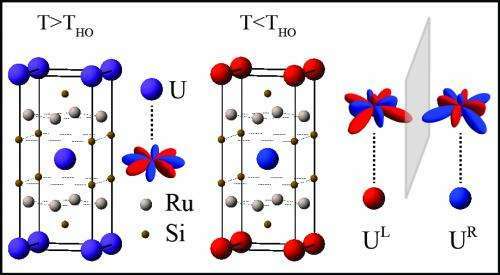 "The Los Alamos collaborators produced a crystalline sample of the uranium, ruthenium and silicon compound with unprecedented purity, a breakthrough we needed to make progress in solving the puzzle of hidden order," said Blumberg. Uranium is commonly known as an element in nuclear reactor fuel or weapons material, but in this case, physicists value it as a heavy metal with electrons that behave differently than those in common metals. Under these cold conditions, the orbital patterns made by electrons in uranium atoms from adjacent crystal layers become mirror images of each other. Above the hidden order temperature, these electron orbitals are the same. 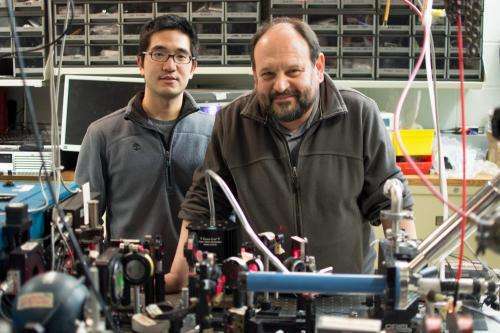 The Rutgers researchers discovered this so-called "broken mirror symmetry" using instrumentation they developed - based on a principle known as Raman scattering - to distinguish the pattern of the mirror images in the electron orbitals. Blumberg also credits two theoretical physics professors at Rutgers for predicting the phenomenon that his team discovered. "In this field, it's rare to have such predictive power," he said, noting that Gabriel Kotliar developed a computational technique that led to the prediction of the hidden order symmetry. Haule and Kotliar applied this technique to predict the changes in electron orbitals that Kung and Blumberg detected. At still colder temperatures of 1.5 degrees above absolute zero, the material becomes superconducting - losing all resistance to the flow of electricity. While not practical for today's products and systems that rely on superconductivity, the material provides new insights into ways that materials can become superconducting. The hidden order puzzle has also been a focus of other Rutgers researchers. Two years ago, professors Premala Chandra and Piers Coleman, along with Rutgers alumna Rebecca Flint, published another theoretical explanation of the phenomenon in the journal Nature. The Leiden University collaborator, John Mydosh, is a member of the laboratory that discovered hidden order in 1985. "The work of Blumberg and his team is an important and viable step towards the understanding of hidden order," Mydosh said. "We are well on our way after 30 years towards the final solution." This is a beautiful and clear example of Art Winfree's law of coupled oscillators, a subject which I have discussed in more than 100 posts on Physorg over the last five years. Many involve superconductivity. Winfree's law explains all three phases described here: higher temp: uranium electron orbitals are the same. Lower temp=electron orbitals are mirror images. Very low temp: superconducting. This article proves my theory. Art Winfree's law of coupled oscillators applies to physics, broadly, including self-organization of electrons up to and including superconductivity. Google physorg Macksb Winfree You will find numerous posts I have made on this topic, most of which explain Winfree's theory in some detail and then show how it applies to the results described in the accompanying physorg article. Very neat. Maybe there is a "warmer", undiscovered version of this phenomenon with other materials? Does this support the hypothesis that Entropy is in fact another form of Order? Winfree's law says that in a two oscillator system, the oscillators will organize the phases of their oscillations in one of two ways. Either exactly anti-synchronous to each other (human legs, walking) or, if possible, exactly synchronous (kangaroo legs). The article above involves a hexadecapole moment. A fancy term for 16. As mentioned in the article, Haule and Kotliar theorized the pattern of hidden order using computational techniques developed by Kotliar. Excellent work by all. But Winfree's law offers another, and simpler, predictive path. Since 16 is an even number, we can use Winfree's simplest model: a two oscillator system. As you can see on the right side of the picture, U left and U right both follow Winfree's rule internally within their 8 unit systems. Then, below 17.5 degrees, their oscillations have a greater sphere of influence, extending through the layer separating them. Then the two 8 unit systems oppose each other, also as Winfree predicts. Now permit me please to offer a Winfree-educated guess as to the mechanism behind the superconductivity in this same article at the very cold level. There, I imagine that the same Winfree two oscillator model applies. At the very cold level, the U lefts and the U rights become so perfectly coordinated in their oscillations, in large groups, that they form Cooper pairs, at a considerable distance from each other. Cooper pairs are themselves a Winfree two oscillator system, precisely anti-synchronous in their oscillations. As far as I know, I am alone in seeing Cooper pairs through a Winfree lens, so feel free to take my educated guess with a grain of salt. Occam's Razor supports my Winfree theory. One simple theory to explain two forms of order. No special computational analysis required. Think deeply about the phrase "hidden order," which appears throughout the above article, starting with the title. A mystery for 30 years, illuminated now by Rutgers. Can you think of another "hidden order" problem in physics? Here are some hints. Also 30 years old. Also studied extensively by the world's top physicists. Quite famous. No answer yet. The second "hidden order" problem is even mentioned in this article. Superconductivity. So: Two hidden order mysteries appearing in the same material, driven by the same variable, temperature. Might they not both have the same theoretical explanation? I think so, and so would William of Ockham. Yet oddly, the article suggests no connection between the two types of hidden order. I say one theory, not two. And the picture of U left and U right screams Winfree as the theoretical solution that can explain both of the hidden orders.